By compressing the limb with graduated compression socks or stockings (strongest at the ankle and decreasing up the leg), they can aid in venous return, decreases venous pressure, prevents venous stasis, reduces edema and deterioration of venous walls. 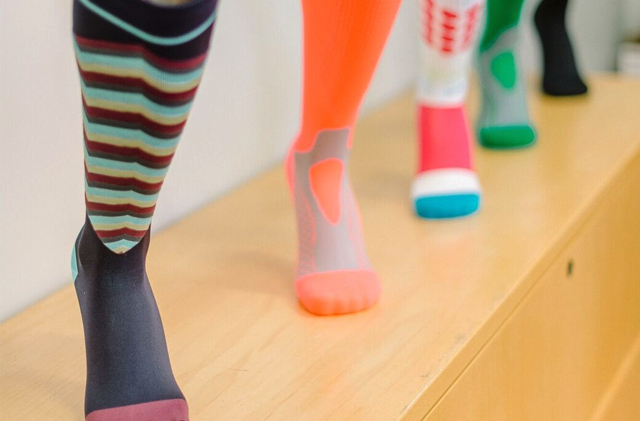 Compression socks work to efficiently relieve aching and heavy legs by aiding the body in moving blood up the leg. Compression socks are often prescribed by our Chiropractor to treat Lymphedema, Thrombosis, tired, achy legs, varicose veins, spider veins and recommended as aftercare following surgery and any other form of varicose vein treatment.